In 1819, the anatomist, Francesco Antommarchi (1789-1838), was sent to St Helena as a doctor. He assisted the British physician Burton, who having found gypsum on the island, was able to take a death mask of the Emperor in several sections. Bertrand and Antommarchi took the central part (eyes, nose, mouth). This original mask, almost certainly now lost, was used to mould a series of masks (that can be called “first generation”) made immediately after their return to Europe, probably in London. Burton explained his grievances against the French in articles in the British press in vain. He died in 1832, which allowed Antommarchi to launch a subscription for “his” mask in 1833, sponsored among others by General Bertrand, General Gourgaud, the Comte de Flahaut, and two of the sons of Marshal Ney. The bronze version cost 100 francs, the plaster one 20 francs. The additional costs of display boxes, packaging and transportation were paid by the subscribers. 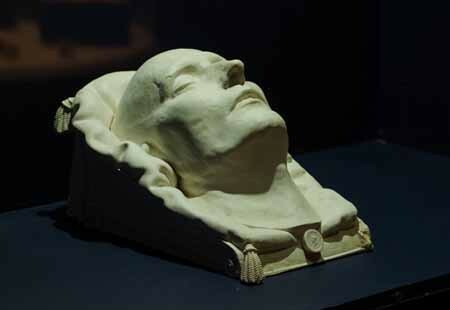 This article is part of our “close-up” on Napoleon’s death mask.